Sometime after 3:00 a.m. on March 18th, gun shots were heard in the San Juan Area of San Pedro Town. Neighbors claimed to have heard up to eight shots and as dawn broke, news that police corporal Gavin Sanchez, detached to the San Pedro Police Department, had lost his life after being fatally wounded by one of his own. Sergeant Paulino Reyes was the officer involved in the shooting, and he went on to officially claim "Self Defense", as a motive in the incident. The initial story was published in Volume 20, Issue #12 dated March 25th 2010, of The San Pedro Sun. The DPP's office has concluded its investigation. For months now, The San Pedro Sun has been pursuing the story, and on Wednesday, October 20th, 2010, the Director of Public Prosecutions, Mrs. Cheryl Lynn Vidal, granted us a telephone interview. She stated, "The prosecution does not think that at this time, there's usable evidence to refute Self Defense in the Corporal Sanchez Sergeant Reyes case; and it is the prosecutor's duty where it rises on the facts, to negate it. The evidence that is available to us shows that Sanchez made several threats to kill Reyes. He made these threats to Reyes himself and he also spoke of his intentions to other officers - not the least of which was his commanding officer, who he called and told he was going to kill Reyes and also sent a text message, stating that he was going to kill Reyes. Evidence presented to the DPP's office stated that when Reyes returned to the station, Corporal Sanchez was seen by another officer in the door at the back of the station and he told the officer to go and tell Reyes that he was back there waiting for him. According to statements on file, Sergeant Reyes then asked two BDF officers to accompany him to his room at the barracks so that he could change and leave the compound; as he didn't want any further problems. The two BDF officers did in fact accompany Sergeant Reyes. One of the officers positioned himself outside Reyes' door while he was in his room. While the officer was outside the door, he saw Corporal Sanchez open the adjacent room with a metal object in his hand as he walked to Reyes' door. When Reyes came out of his room, Sanchez hit him on his head with the metal object. Reyes then retreated to his room. The piece of metal used was stuck between the frame of the door and Sanchez tried to remove it from where it was. The BDF officer held on to him and reported, (quoting BDF officer) ‘the sergeant then was opening his door, and upon seeing this, the corporal who I was holding, then moved his right hand, placing it on his right side of his waist as though he was taking out something. I must mention that because of the position I was holding him in; I couldn't see what he was taking out of his waist. That was when the Sergeant took out his gun and pointed it in the direction of the leg part of Sanchez and the Sergeant fired a shot'. When that happened, the officer pushed Sanchez and then he went for cover, he went to protect himself then." The DPP continued to explain, "The problem that the prosecution has is that after the BDF officer went to take cover, there's no eye witness evidence as to what took place thereafter. 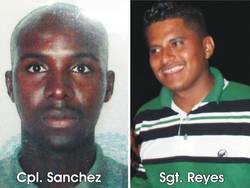 And the biggest factual challenge is that what the BDF officer said is that the last thing he saw was that Sanchez had a firearm in his hand and was pointing it at Reyes when he went for cover." The DPP went on to explain that "we don't have any eye witness evidence as to what happened after that, there was no one else around. And that is the biggest factual challenge, because if it is that the Corporal remained with a firearm in his hand, pointing it at the sergeant and the sergeant began firing shots we cannot say that the shooting was un-justified, because you have a right to self preservation if someone is standing in-front of you pointing a firearm at you. By law, you can shoot that person before that person shoots you. We have no evidence to show when that firearm fell. When persons responded to the scene and saw the corporal on the floor, the firearm was next to him. That suggests that he either fell with it, or it fell shortly before he fell. It's not to say it was found at one location and his body was found several feet beyond that point. If we don't have any evidence to show that the firearm fell and at what point and therefore there was no longer any threat, how can we say then, that the sergeant wasn't justified in firing the shots? Further to that, Dr. Estradaban's report explained that even-though there were nine shots that connected with Cprl. Sanchez, the first seven of those shots would not have immobilized Cprl Sanchez because they were not shots sustained to any major organs, or shots that caused any fractures." According to the DPP, Dr. Estradaban's report continued to explain that, "therefore, Corporal Sanchez would have remained standing even though he had those seven shots. It was the 8th shot which was to the head that would have caused him to start falling. The 9th shot was the shot that went through the forehead and would have caused him to completely fall." Dr. Estradaban's report further stated that "If Sanchez had been on the floor when the 9th shot was fired, there would have been a different pattern of injuries in his head." Therefore in Dr. Estradaban's expert opinion, he stated, "Sanchez was falling but nonetheless still in an upright position at the time that he got that last shot." The DPP concluded that, "If we put all that evidence together, the prosecution does not have anything to disprove self-defense. For these reasons, I was not able to direct that Sergeant Reyes be arrested and charged with any offence." The DPP's findings have been sent to the Coronor's office, which it is expected, will carry out an inquest. However, the DPP mentioned that based on the evidence presented by the police and the file, there are no foreseeable changes in the conclusion, even after an inquest is conducted, that would warrant an arrest and charges laid. Sergeant Reyes was placed on administrative leave while the investigation was being carried out. When asked about what happens to him now, the DPP stated, "that is really a decision for the commissioner of police to make, he is aware of my decision. It is now up to the commissioner to decide whether Sergeant Reyes will be brought off his administrative leave immediately or whether they will await the inquest". The DPP went on to explain that in this case the easiest thing to have done was to direct that an arrest be made, however at the time of trial, there would have been serious embarrassment to the [DPP's] office as they would not have been able to get a case to the jury. The process was long as all aspects of the file and evidence presented had to be examined thoroughly, leading to what may seem as the delay in a decision. The DPP expresses her understanding of the need to have someone to blame, when someone has lost a loved one, and sympathizes with the family of Corporal Sanchez. However, she explained that based on the law, her office cannot prosecute on emotions, but rather on facts and evidence presented. The DPP has concluded that Sergeant Reyes acted in Self Defense, based on evidence and facts presented to the Office.